Recipe modified from the Barefoot Contessa. Wow, these look amazing! Love, love, love coconut! Thanks so much. Thanks Jessie! These are SO simple to make…I really was surprised! That is really easy! And I just so happen to have grated coconut and sweetened condensed milk left over from something else but didn’t know quite how to use up. I think I’ll whip me up somethin’ sweet tonight! 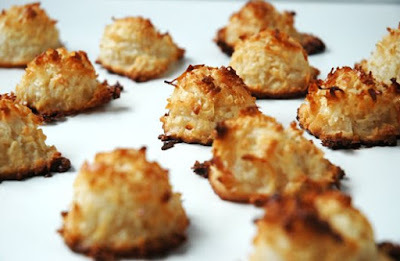 Yes, it is just amazing to me that these macaroons are this easy to prepare…would love to know how yours turn out! I have a similar recipe that gets raves every time I make them. I like to food-process the coconut before mixing, to make the flakes smaller. I like the texture better that way. Also – these macaroons taste soooo much better a day (or three) after they’re made. Seal them in a cookie tin, and they soften up and get all super yummy!